The Breakfast Bloom . . . The story of many immigrant wildflowers begins with imported seed that arrived laced with a hitchhiker, a plant variety that over time would go against the grain in a very different sense of the phrase. Once established in some New England field, the rest of the tale became the incremental spread of a European or Asian green immigrant from one blue sea to the other. Escaped and naturalized, some have become part of home remedies, regional folklore, even the incidental detail of fine artworks. 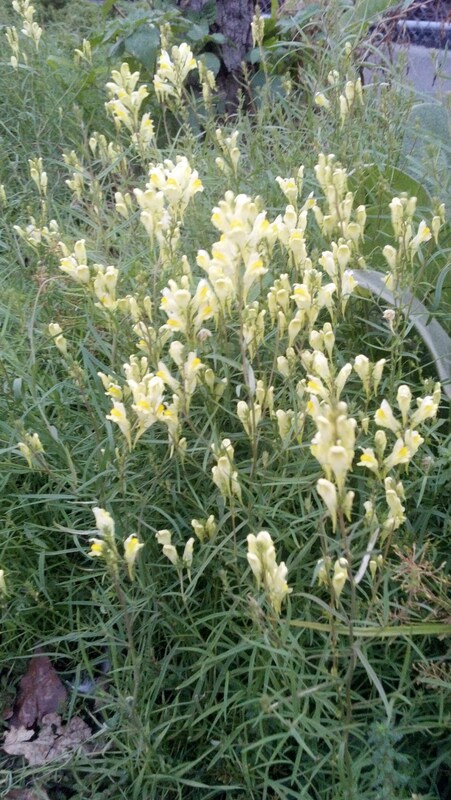 Of these, one of the most notable, and beautiful, is what I like to call “the breakfast bloom” – Butter-and-Eggs, known also as Yellow Toadflax, Linaria vulgaris. Yellow Toadflax is a perennial and a ruderal of European origin, which together explains the familiarity of this wildflower. One sees it appear every year as summer passes into autumn and the plant blooms in those under-grown areas where it can stand out such as roadsides, which is where I found a patch growing, and blooming, in the West Village: beside the bike path that parallels the West Side Highway. This wildflower is easy to identify. The leaves are linear, thin and spiky, and alternate up the stem to the blooms. The individual flowers are irregular, end in a long spur, and are butter yellow with palates the color of egg yolks. There is a close resemblance to cultivated snapdragons. In fact, that is an apt comparison, as both belong traditionally to the figwort family, Scrophulariaceae. 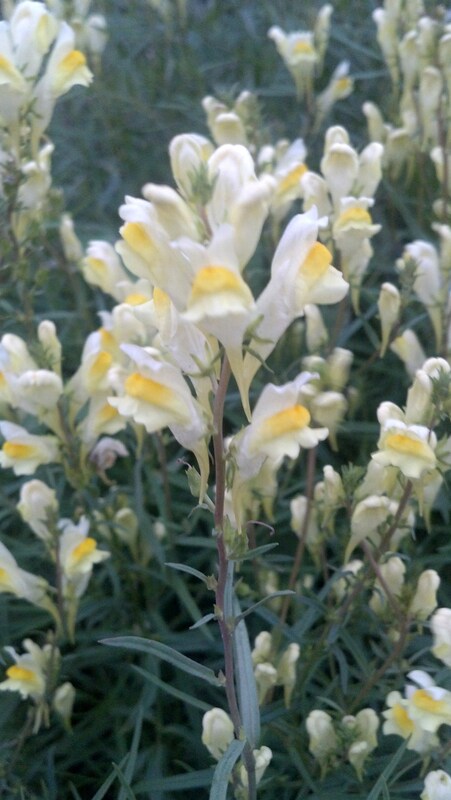 The snapdragon has been moved recently to another, Plantaginaceae, based on DNA sequence analysis, but like the snapdragon, the flowers of Yellow Toadflax grow in clusters, in terminal racemes, which can last a long time set in a centerpiece vase on the breakfast table.